Amy Rigby’s brief UK tour begins tonight at O’Riley’s in Hull. Following that, she’s at the Prince Albert in Brighton on Tuesday, 27th and the Musician Pub in Leicester on Wednesday, 29th; on Thursday she’s at the Thunderbolt in Bristol and, finally, Friday 30th, she plays the Betsy Trotwood in London. After which it’s smartly back to the US and Hoboken, Cleveland, Knoxville, San Francisco et cetera. Oh, but before that she’s recording a guest spot for the Mark Riley Radio Show on BBC6 Music on Monday, 26th. Actually, it may be live, I really don’t know. The Old Guys, Amy Rigby’s first solo album in a dozen years, measures the weight of heroes, home; family, friends and time. Philip Roth and Bob Dylan, CD/cassette players, touring, the wisdom of age and Walter White, groupies, Robert Altman, egg creams and mentors are paid tribute. Twelve songs written unmistakably by Amy and recorded by Wreckless Eric in upstate New York, The Old Guys is the sound of a good girl grown up, never giving up. If this sounds like your cup of tea, check her out, go see her, have a listen. I think she’s special. Once upon a time – 2009, to be exact – there was Minor Key, a nicely put together limited edition hardback published by Five Leaves of Nottingham and containing five short stories, half a dozen poems and an introductory essay, “Resnick, Nottingham and All That Jazz”. Well, now the good folk at Five Leaves are set to publish something in the way of a sequel: Going Down Slow & Other Stories – seven previously uncollected short stories in a limited edition hardback with a run of 1000 copies, the first 100 of which will be numbered and signed. Publication date is Tuesday, 14th November and there will be a launch event at Five Leaves Bookshop between 7.00 & 8.30pm that evening. Admission is free, but, as anyone who’s been to the shop will know, space is limited, so if you’re thinking of going along, best to RSVP to events@fiveleaves.co.uk or risk being shut outside, looking in, with only the occasional punter heading for the betting shop next door for company. As you’ll see from the cover, there’s a bit of a retro thing going on: retro-noir; retro-hard boiled detective; retro-fedora. Which is the title of one of the stories – “Fedora” – the story that was awarded the CWA Short Story Dagger in 2014. It’s a Jack Kiley story – as are “Second Chance” and “Dead Dames Don’t Sing”, the latter a tale of rare books, rarer manuscripts and pulp fiction that first appeared in the Bibliomysteries series published by Otto Penzler’s New York-based Mysterious Bookshop. Kiley, for those who haven’t previously made his acquaintance, was formerly an officer in the Met, as well as, briefly, a professional footballer, and is currently eking out a living as a private detective in North London – hence the fedora, given to him by his friend Kate as a kind of joke. Joke or not, he wears it well. Along the three Kileys, there are two Nottingham-based stories featuring Charlie Resnick – “Not Tommy Johnson” and the title story, “Going Down Slow” – and a third Nottingham story, “Ask Me Now”, a companion piece to “Sack O’Woe”, which first appeared in a Mystery Writers of America anthology, The Blue Religion, edited by Michael Connelly. And if you’ve been counting you’ll know that leaves one more: “Handy Man”, a rare, for me, exercise in writing in the first person, female first person at that, which takes off from the excellent Amy Rigby song, “Keep It To Yourself”. If you can’t get along to the launch in Nottingham, but live down south, on the Monday of the week following, the 20th, I shall be at the Owl Bookshop in Kentish Town with the writer Woody Haut, to celebrate the publication of his novel, Days of Smoke, and to talk about both that book and Going Down Slow. And just to round things off, on Friday 24th, 6.30 – 7.30pm, I’m reading with the John Lake Band at a Ray’s Jazz event at Foyles Bookshop in Charing Cross Road. Mostly poetry on this occasion, but I’m sure the short stories will sneak in there somewhere. And should you want to pre-order a copy [there are only 1,000, remember] you can do so from the Five Leaves Bookshop bookshop@fiveleaves.co.uk / 0115 837 3097. Price £12.99 post free in the UK. Denis Johnson, poet, short story writer, and novelist died on the 24th of May. Although his Vietnam novel, Tree of Smoke – sprawling, busy with moments of brilliance and confusing and difficult to grasp as the war itself – won the US National Book Award in 2007, for me his best work is to be found in his shorter fiction, Train Dreams (2002), set in the American West at the turn of the century, the fast and nourish Nobody Move (2009), and the collection of incendiary short stories for which I suspect he will always be best known, Jesus’ Son (1992), from which these short extracts are taken. The Vine had no jukebox, but real stereo continually playing tunes of alcoholic self-pity and sentimental divorce. “Nurse.’ I sobbed. She pour doubles like an angel, right up to the lip of cocktail glass, no measuring. “You have a lovely pitching arm.” You had to go down to them like a hummingbird over a blossom. I saw her much later, not too many years ago, and when I smiled she seemed to believe I was making advances. But it was only that I remembered. I’ll never forget you. Your husband will beat you with an extension cord and the bus will pull away leaving you standing there in tears, but you were my mother. It was there. It was. The long walk down the hall. The door opening. The beautiful stranger. The torn moon mending. Our fingers touching away the tears. It was there. And then came one of those moments. I remember living through one when I was eighteen and spending the afternoon in bed with my first wife, before we were married. Our naked bodies started glowing, and the air turned such a strange colour I thought my life must be leaving me, and with every young fibre and cell I wanted to hold on to it for another breath. A clattering sound was tearing up my head as I staggered upright and opened the door on a vision I will never see again: Where are my women now, with their sweet wet words and way, and the miraculous balls of hail popping a green translucence in the yards? We put our clothes on, she and I, and walked out into a town flooded ankle-deep with white, buoyant stones. Birth should have been like that. A while ago, 2009 to be precise, Nottingham-based small press publisher, Five Leaves, brought out a snazzy-looking hardback collection of my stories and poems in a limited edition. Minor Key, by name. The good news is they are going to follow it up, this November, with a similarly sized book, also a limited edition, bringing together seven stories which have not previously appeared together in any collection. Going Down Slow & Other Stories will include two Charlie Resnick stories, three featuring my North London-based private detective, Jack Kiley, and two others. Of the Resnicks, “Going Down Slow” was first published as an ebook by Random House in 2014, and then reprinted in the same year in a special Arrow paperback edition of Darkness, Darkness for exclusive sale at Sainsbury’s.“Not Tommy Johnson”was first published in OxCrimes, edited by Mark Ellingham & Peter Florence for Profile Books, also in 2014. The first of the Jack Kileys, “Fedora” was first published in 2013 in Deadly Pleasures, edited by Martin Edwards for Severn House and was the winner of the CWA Short Story Dagger in 2014. “Second Chance” was first published in 2014 in Guilty Parties, again edited by Martin Edwards for Severn House.The most recent of the three, “Dead Dames Don’t Sing”- more a novella, I like to think, than a short story – was first published as No.32 in the Bibliomystery Series, edited by Otto Penzler for the Mysterious Bookshop in New York in 2016. 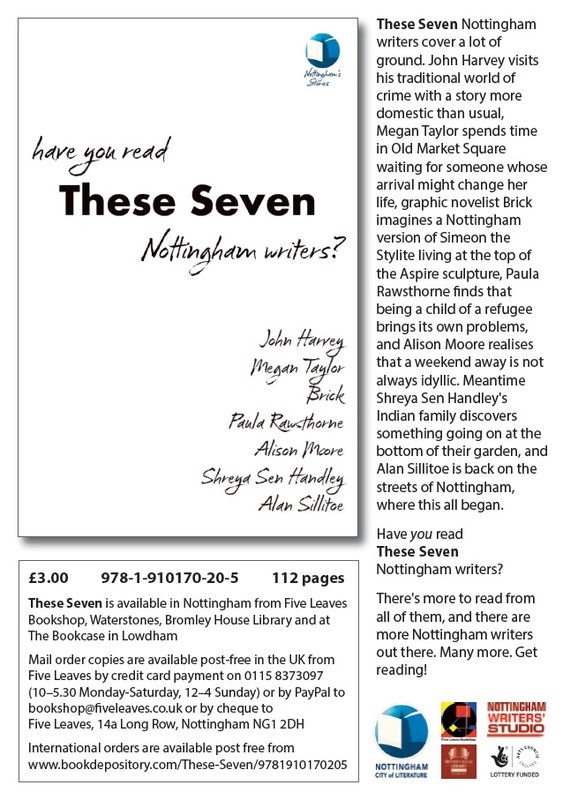 Which leaves two strays: “Handy Man”, which was published in Ambit magazine, No 204, in the Spring of 2011, and “Ask Me Now” , which was published in 2015 in These Seven, edited by Ross Bradshaw for Notingham’s Five Leaves Bookshop, in association with Bromley House Library and Nottingham Writers’ Studio. Take all this as an early warning; there will be more details, including how and where to order copies, at a later date. Jim Burns and I have crossed paths in a number of ways since 1978 when he first published poems of mine in Palantir, the small press magazine he edited between 1974 and 1983; poetry aside, we have a shared interest in jazz and painting and have kept up an exchange of correspondence across the years, meeting from time to time at readings – most happily one organised by John Lucas in Nottingham some little time back, when we read together. Closely associated with the magazine Beat Scene, Jim was also, for many years, a principal reviewer of poetry for Ambit, and now contributes regularly to Penniless Press’s on line Northern Review of Books, from which the following review comes. Jack Kiley is a one-time aspiring footballer whose career was disrupted by injury, an ex-policeman, and a jazz fan. He now works as a private detective, “investigating dodgy insurance claims, snooping on behalf of a local firm of solicitors or shadowing errant wives.” And then one day he’s asked to contact a bookseller who has been offered the chance to buy a supposedly long-lost, unpublished pulp novel written to make money by a talented, but hard-drinking, impoverished poet. The poet died years ago, but one of his daughters claims to have found the manuscript in a cottage in Cornwall once owned by the family. The bookseller needs to know if the manuscript is genuine, and hires Kiley to see what he can find out about it. Kiley doesn’t claim to have an awareness of most twentieth century literature, apart from writers like Patrick Hamilton, Graham Greene, Eric Ambler, and Gerald Kersh, and often puts on the typically English “straight-talking, call a spade-a-spade, don’t-waste-any-of those-high-faluting-ideas-on-me act” when he comes across people connected to the arts. The thought of attending a lecture at the British Library on some poets who were “the Visionary Heirs of William Blake” is enough to make him shudder. Perhaps his main concession to an interest in anything artistic is the jazz he listens to. He likes Chet Baker, but has his doubts about Miles Davis. He’s not averse to some classical music, either, especially if it’s likely to put a lady at ease. And he does sometimes pay attention to the visual arts, though is reluctant to admit it: “I like a good snap as much as anyone,” he replies when asked if he’s into photography. Kiley’s investigations bring him up against the poet’s daughters. The one who claims to have found the manuscript, and have the right to sell it, is a slick opportunist who has worked as a model, actor, and photographer. She knows how to use her good looks to get what she wants. The other is a somewhat frosty individual who is employed at the Poetry Society, says the manuscript is a fake, and is about to have a “literary” novel published. She’s careful to make it clear that she doesn’t think that her father would have written a novel called Dead Dames Don’t Sing set in the jazz clubs and pubs of 1950s Soho with a cast of shady characters, and that her own forthcoming book is superior to anything in that line.. Neither woman makes a good impression on Kiley. His own lady friend is a journalist with a sense of humour and a down-to-earth approach to dealing with his hang-ups about art and life. She likes to read Dickens and similarly big books, whereas Kiley thinks a couple of hundred pages at most is what a novel should add up to. The cast of characters in this short, but entertaining book includes the bookseller, the late poet’s small-press publisher, now a resident in a nursing home, the daughter of an actress who may have had a fling with the poet, and sundry others, such as a dead screenwriter, an equally deceased and long-forgotten, pulp novelist, and a plumber in Penzance. They all add colour to the story, as do the little comments on life in London. Kiley seems to have problems when it comes to finding suitable accommodation. He loses one apartment (referred to that way no doubt because this is an American publication: flat might better describe the kind of places Kiley lives in) when the site is about to be redeveloped, and another, above a charity shop, when the property is going to be taken over and turned into an estate agent. It’s suggested that Kiley might be able to stay if the new owners keep the flat, but he inclines to the view that he’s choosy about who he associates with. As I watch the estate agents increasingly moving into various premises around where I live I have a certain amount of sympathy with his attitude. I won’t delve too much into how and why the mystery of the manuscript is resolved, but it’s a tribute to John Harvey’s skill as a writer that everything is neatly wrapped up in such a short space. But, like one of the people in his book, he’s had a great deal of experience over the years as a novelist, short-story writer, poet, writer for TV and radio, publisher, little magazine editor, and much more (the back cover of Dead Dames Don’t Sing notes that he’s the author of more than one hundred books) so knows how to make an impact within a limited (in length, not content) framework. His characters take on real personalities with a minimum of effort. And he cleverly constructs a couple of convincing passages from the contested manuscript. It’s easy to see why he, like Kiley, admires writers such as Eric Ambler and Gerald Kersh, who were professionals in every sense of the word. I share his tastes and was delighted recently to find several old Kersh books in a local charity shop. I was amused by the fact that attitudes towards crime novels and pulp writing (not necessarily the same thing) among some literary types are shown as still being coloured by their belief that they often represent an inferior area of activity. I’m possible prejudiced, having enjoyed many crime and pulp novels and short stories. And I’m convinced that the writing in them can sometimes be far superior to what I’ve read in “literary” novels. I’ve delighted in books by Gil Brewer, Richard Deming, John D. MacDonald, and William P. McGivern. Just a few from the hat. Those are the names of older writers, I know, but they’re the ones I like to read and even, in a small way, collect. With newer novelists I’d have to point to John Harvey as someone whose books always appeal to me. A note on the publisher of this book. The Mysterious Bookshop is located in New York and Harvey’s book is the thirty-third in what they call their Bibliomysteries series, all the stories having connections, of one sort or another, to writers, bookshops, libraries, and books in general. Dead Dames Don’t Sing is available now in paperback, or signed hardcover, from The Mysterious Bookshop, and will shortly be available also as an eBook. In contrast, all Whitemore’s wife had left him, the day she drove off to her parents in Chapel St. Leonard’s, taking the twins, was a note propped against the burned-out toaster in the kitchen. That had been six years ago. His father had been dead for ten. Whitemore was still in the same house, a lodger upstairs in the twins’ room Monday to Friday, and he was still doing the same job – the one his wife had hated – detective sergeant in the Public Protection Team: domestic violence, hate crime, serious sexual abuse, assault. She turned aside from his face, flinched at his touch. Flinched when he held one or other of the twins in his arms, helped them to undress, softly kissed the tops of their heads, ran the flannel across them in the bath. Details of how to get hold of a copy are listed above. 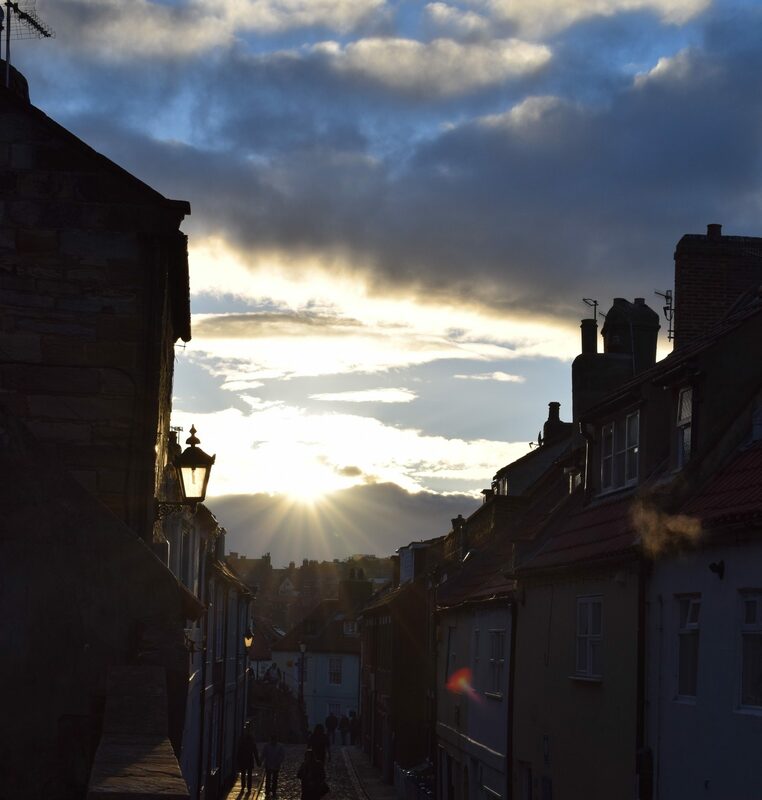 All the contributions are well worth reading – the Alan Sillitoe is a beaut – and it’s worth making the effort. And it is only three quid!!! 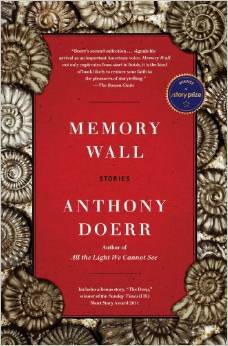 Until quite recently I hadn’t heard of the writer Anthony Doerr (and still don’t know how to pronounce his name). But there was a short story of his in Granta, the American Wild issue, and despite it having the kind of title that most days would send me running quite fast in the opposite direction – it’s called “Thing With Feathers That Perches in the Soul”– I sat down to give it a read. It was only 11 pages, after all. Doerr’s second book, a novel entitled About Grace, is about a hydrologist named David Winkler who occasionally dreams events that later come true. The book tries to ask questions about snowflakes, predetermination, the nature of family, and the intersections of the human and natural worlds. … which didn’t exactly seem my natural cup of tea and turned out to be – and excuse me for this – somewhat over-brewed. To be a tad more specific, I found it overlong, with a central section that sat uneasy between the rest, and in places over-written – Doerr writes with elegiac beauty about human frailty and the power of nature, weaving complex metaphors into a literary carpet of dazzling numinosity and with a long middle section that sat uneasily between the rest, said the Evening Standard, that well-known arbiter of literary taste. 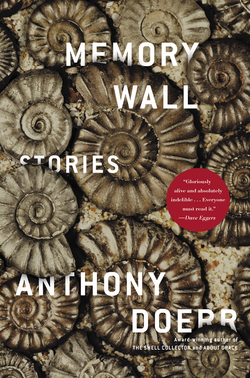 But because I did like some of the book a good deal, I went back to the stacks and came up with a collection of stories under the title, Memory Wall. Just six stories (with a extra one added for the UK paperback edition: seven stories, then, of which four are, I think, quite brilliant, and the other three merely very good indeed. The writing is quite matter-of-fact, straightforward even, but with lyrical touches; the characterisation clear and distinctive; the settings range from middle America to South Africa via Lithuania. The title story, and at 85 pages by far the longest in the book, centres around the wavering mind of an elderly white South African woman in a country radically divided by race, money and class; in “Afterworld” another ageing woman is increasingly swamped by memories of her childhood friends who perished in the Holocaust while she survived; in the additional story, “The Deep”, the main character is a boy who has been told that, because of a heart defect, he will not live beyond his middle teens. Difficult material with a propensity, one might think, for strong emotions and tragic endings. Tick the former, though the writing keeps them well controlled, but nix the latter. The one thing that links these stories, and which, in the current literary climate, renders them unusual, is the almost complete lack of ironic distance, the way in which Doerr endows them with a positive humanism which stays just the right side of sentimentality, while allowing for tears. I read these stories not just with a sense of joy, but also of awe. I could never write stories like that, I thought, when finally I laid the book aside. I want to write stories like that, I thought, and one day I might try.